Objectives: To learn how to customize and automate your workflow in Photoshop 7 by using the Batch Processing command to quickly process large groups of images. In an earlier lesson, you learned how to create your own actions for tasks you repeatedly perform. In this lesson, we'll take it a step further by applying our new action to a batch process. Batch processing is useful when you have a lot of images that require the same actions to be applied to them. With a couple key strokes you can quickly "process" an entire folder of images. We'll use the action we created in the Actions lesson but of course you can use your own or just follow along. I have a folder of full sized images that need to be converted to thumbnails. I also want them to have a drop shadow applied to them and have them converted to .gif to use on my website. I've already created my action to process each image, but I surely don't feel like going through each image and applying the action it. 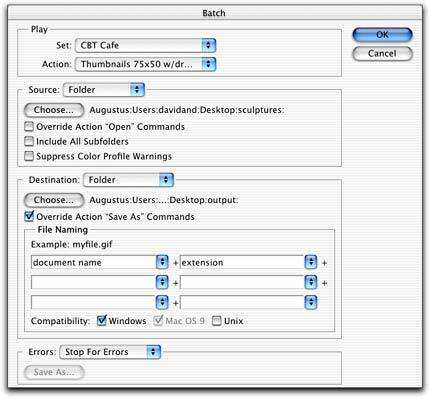 Instead, I'll use the Batch Process command to apply my action to my folder of images. In the Play option, select which Set contains the action you want to apply. In this example, "CBT Cafe" is the Set I selected. Choose the Action to apply. I only have one in this set and it's called: Thumbnails 75x50 w/drop shadow. If I had more actions in this Set they would be visible from the drop down menu. In the Source option, choose Folder from the drop down menu and then click the Choose... button to navigate to the folder containing your images. For Destination select Folder from the drop down menu. Another option I frequently use for Destination is the None option. By selecting None, Photoshop applies the action to the images but leaves the images open. This is helpful if I want to preview my new images and determine if I need to make any further edits to them. For this example, however, we'll select a folder. After you select the Folder option, click Choose... to select your destination folder. You can select a current folder or you can create a new one. I'll create a new one called Output on my Desktop. The next option, Override Action "Save As" Commands, should be selected if your action contains a "Save As..." or "Save for Web..." command. If your action doesn't contain a "Save As..." command you'll need to keep this option unchecked to save your files. Photoshop will prompt you to save each file when this option is not selected. For my example I'll select the option since I have a "Save for Web..." command in my action. The last option I typically select is for Errors: Stop For Errors. This is very helpful for debugging your commands.